The battle against baldness may be a fight you can win. That's the growing medical consensus in the field of dermatology. The November 2017 issue of the Journal of Drugs and Dermatology (JDD), a highly respected resource for dermatologists and researchers worldwide, published the first peer-reviewed article validating one company's nutraceutical approach to healthy hair growth. When it comes to understanding hair health, Nutrafol® has taken a scientifically driven, holistic approach. By unpacking the effects of internal and external triggers, they have created a high-quality, innovative solution for individuals experiencing hair loss. "As scientific research reveals more about hair follicle biology, we are compelled to look at the common thread within all hair disorders—the complex dysregulation of immune, inflammation and signaling cascades that regulate follicle homeostasis," says Sophia Kogan, MD, Chief Medical Officer, Nutrafol. "We're thrilled to have the medical communities support as we continue to research drug-free solutions that not only help stimulate healthy hair growth but also improves one's overall health." To get to the source of hair loss, Nutrafol has identified the natural cycles of growth, regression and rest that each hair follicle experiences based on its individual biological clock. Considering the environmental changes affect the hair follicle’s production cycle, Nutrafol addresses both internal and external triggers that can influence the body’s immune system and metabolic pathways. By looking at the follicle, Nutrafol has established common threats to the hair cycle, which include free radicals, oxidative stress and inflammatory markers. This disruption produces damaging molecules and additional free radicals, setting of a chain reaction that puts the follicle and immune system in motion by producing a chemical molecule known as cytokines. This is what causes the hair to stop growing. By taking a closer look at the many triggers that can lead to hair loss, Nutrafol has identified the close communication that exists among signaling molecules and how that can disrupt the growth cycle of healthy hair. What they’ve found is that inflammatory markers, free radicals and damaging chemical are to blame. A signal to the follicle at the wrong time can trigger catagen (Regression) phase rather than anagen (growth) phase, and hair cannot replace itself without anagen signaling. We know this as hair thinning. Once the hair growth cycle has been broken, a domino effect occurs: nutrients cannot reach the follicle efficiently which means they can’t be absorbed. Nutrafol calls this “the starving state”, DNAD or (deficient nutrient absorption and delivery). Nutrafol has conducted extensive research to develop a solution that targets all triggers that interrupt hair growth. By breaking the counterproductive cycling and signaling, and removing the follicle from its DNAD state, Nutrafol’s formula changes its signaling and improves the follicle’s environment so it can heal. Once a new growth cycle starts, healthy hair can once again grow. This patent-pending, scientific formula combines nutraceutical-grade phyto-nutrients and the multi-dimensional properties of therapeutic nutraceuticals that work together to improve hair health. It’s an aggressive method that kickstarts healthy hair growth from the base. Nutrafol is changing the way we look at proper hair health and has the science to back up their approach. Instead of focusing on a Band-Aid solution by looking at a single trigger, Nutrafol combats multiple triggers and molecules that are often the cause of an imbalanced follicle. Their push to end disruptive signaling, meant designing something that actually breaks the cycle. "Up until now, physicians have had very few, if any, healthy options to offer patients concerned with poor hair health," says Nutrafol's president, Roland Peralta. "Our researchers created an award-winning solution that fills the void by providing the medical community a healthy and effective option, without side effects, for their patients in the treatment of poor hair health." Removing certain triggers alone acts as a temporary fix. By harnessing the power of nutraceutical-grade botanical ingredients, Nutrafol is combatting all triggers including stress and free radicals, both of which greatly disrupt proper hair growth. Nutrafol’s formula enables follicles to heal by encouraging the body’s natural processes. While our bodies have everything they need to protect and heal us naturally, everyday challenges can stand in their way. Physical and emotional stress, aging and free radicles make it impossible for follicles to naturally protect themselves from these triggers. For healthy hair growth to take place, follicles must be strong enough to not only combat triggers and damaging molecules, but also to improve the body’s natural ability to heal and protect. 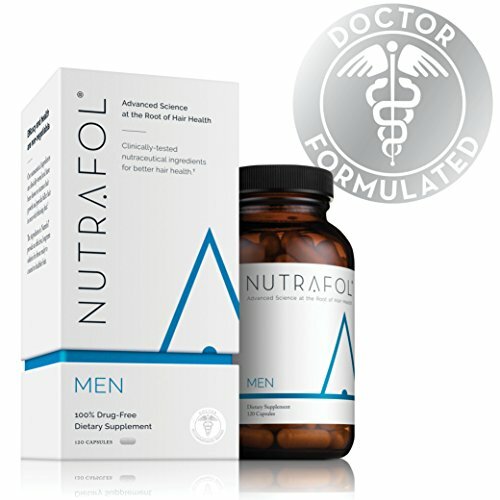 Nutrafol has created distinct and different formulas for men and women that increase the body’s natural antioxidant defenses, fights against aging and boosts the immune system to support follicle growth, enabling the damaged follicles to heal from the inside out. Nutrafol also works to improve the flow of blood and the health of the scalp. The way of the future is to support and stimulate hair. Nutrafol is promoting healthy hair with its vitamin and mineral-enriching formula that increases signaling molecules and stimulates healthy hair growth cycles. The story of Nutrafol begins with a male model whose career was at stake when he started losing his hair in his early 20s. Frustrated by poor results and undesirable side effects from existing medical interventions like expensive drugs and ineffective shampoos, Gorges Tsetis, together with his co-founders Roland Peralta, Sophia Kogan, MD, began to uncover a growing body of research challenging the science behind conventional hair loss solutions. In 2015 they teamed up with world-renowned hair loss experts in the field of dermatology and integrative healthcare to develop a nutraceutical hair growth supplement composed of clinically-tested ingredients. With continued investment in research and clinical studies, Nutrafol has taken the lead in the nutraceutical hair loss industry. Unilever Ventures, the venture-capital and private-equity arm of consumer packaged goods conglomerate, has recently staked an investment in Nutrafol. New York, NY 10001. The company can be contacted by calling 888.454.3320 or by email at support@nutrafol.com; or follow them on Facebook at https://www.facebook.com/nutrafol/ . High doses of vitamin B7, or biotin, an ingredient in Nutrafol, can interfere with hundreds of common lab tests. In some cases, extra biotin causes falsely high results on tests. In others, it causes the results to read as falsely low. Users of Nutrafol, biotin or vitamin B7 are encouraged to disclose usage and dosages to healthcare practitioners prior to taking any lab test.